I started this blog with the idea that I’d blog my dinner, which turned into cooking for the blog which turned into freelance work and somewhere around starting an LLC and registering trademarks I realized that I rarely or never blogged my dinner. I did an interview recently and the interviewer asked for links to my “go to week night meal,” and I was more than embarrassed to say that I’d never really blogged it. This is just one version of my 15 minute chicken that seems to make it into regular rotation. 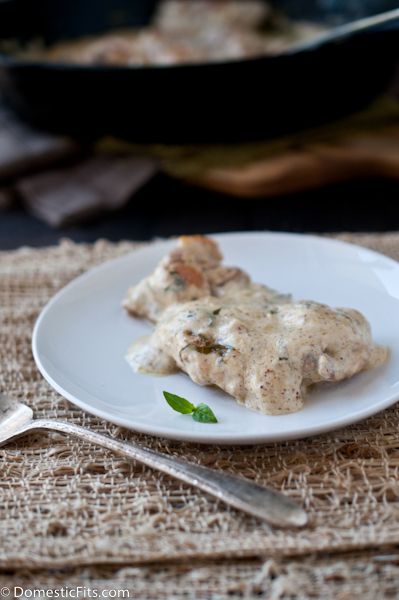 I always use boneless skinless chicken thighs, the flavor is worlds above the chicken breast and it is almost impossible to dry out. 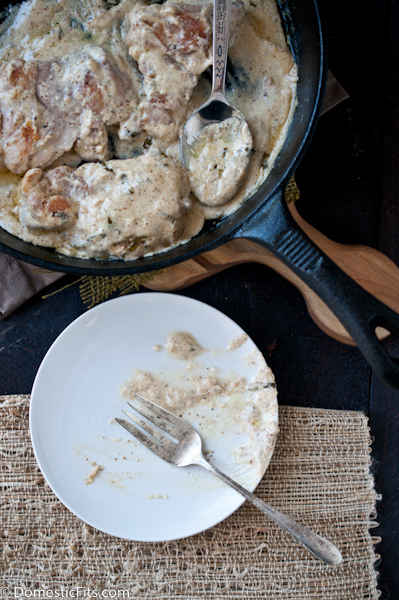 I love to cook them in a cast iron skillet because of the awesome crust it gives the chicken. The sour cream version was a big hit, so I’m sure it will make it into my busy weeknight menu again. sprinkle the chicken thighs on all sides with salt and pepper. Heat olive oil in a cast iron skillet until hot and almost smoking. Add the chicken thighs and sear on both sides until browned. Whisk together the remaining ingredients, pour over chicken. Lower heat to medium-low, cover loosely and allow to gently simmer until chicken is cooked through, about 8 minutes. Serve with sauce over starch of choice. Yummm I wonder if this could be made with greek yogurt and still be as good. I might have to try! 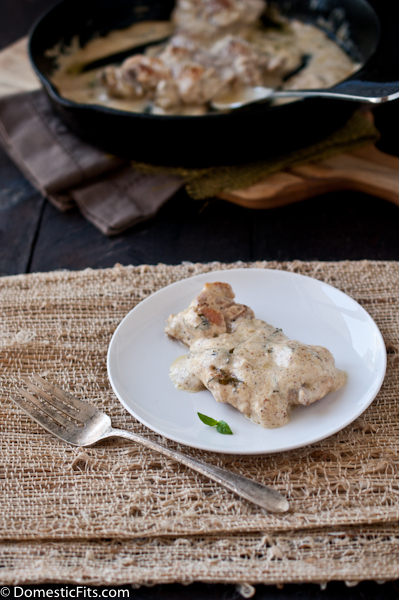 I used to make sour cream chicken in slow cooker. It was a family favorite! How fun to make it in a skillet! So much faster! Thanks, Jackie! I just two giant packages of chicken thighs at Costco so this is going on the menu for next week! I love the sound of this one! Isn’t it funny that some of our favorite and simplest meals never make the blog? I think you have inspired me to change that! So easy! And I love that you use boneless skinless thighs. Those are my go to. The boneless skinless breasts just don’t have the right flavor for me. Love this! Now this is what I call dinner! This looks so damn good, Jackie! This looks so wonderful! Love that you used chicken thighs!! Looks so easy and delicious-Thanks for sharing! We eat a lot of chicken in our house so I’m always looking for a new chicken recipes. This one sounds delicious. I’ll be making it very soon. Thanks for sharing. My mom used to make something like this when I was younger. So amazing! This looks great! I’m so glad that this recipe made it to the blog! And that sour creamy-mustard sauce looks amazing. I could slather that on anything and everything! Haha! I started my blog thinking the same thing and of course I now cook for the blog! It’s never what do I want for dinner, it’s what have I not done and what sounds fun and different. Now that I think about, I have never posted my go to pasta and chicken dishes that I make at least once a week! So glad I get to see this awesome chicken. it looks perfect and I think everyone, the picky brothers included would eat this. YES! I’ll definitely make this again, with a little less mustard as I’m not much of a fan. Otherwise vey good and quick. Thanks for sharing. This was delicious, easy, and looked just like the picture. The vinegar and Dijon mustard addition was a good kick of flavor. I loved using my cast iron skillet. I made it – loved it! Didn’t have honey, used sugar. Didn’t have fresh basil, used dried sweet basil… added grated lemon zest…wow, we loved this quick and super tasty meal! Wanted to serve with a sprinkle of parsley or cilantro on top, but didn’t have any. Ended up chopping some nice & fresh celery leaves instead – it worked nicely! Served on angel hair with an arugula, kale, tomato, avocado and chick pea salad with balsamic dressing. So good!